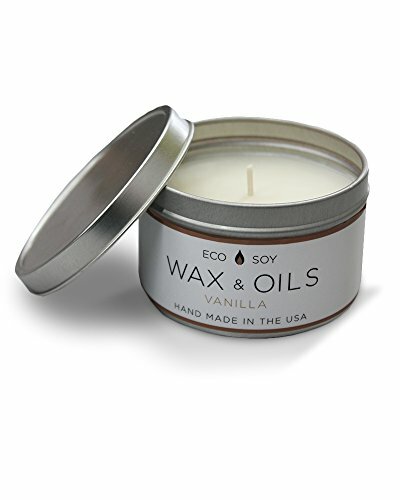 VANILLA: Put a spring in your step! PLEASANTLY SWEET & SOOTHING: Everyone from toddlers to adults can enjoy. 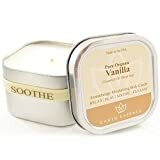 The scent of Vanilla has a relaxing, calming effect on the entire nervous system which provides relief from anxiety and restlessness. 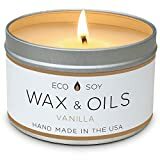 NO DYES: Wax & Oils Vanilla contains no dyes and is a great choice candle for home decor, meditation, Yoga, dance, aromatherapy, general relaxation and stress relief. 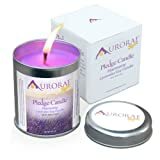 Scented (Vanilla) Soy Wax Aromatherapy 8oz Massage Candle in Square Tin - Made in USA with Pure Essential Oil and All Natural Ingredients.